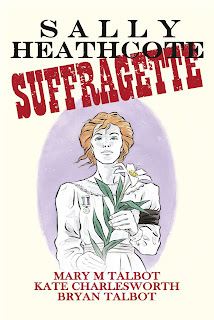 I'll be the first to admit that I knew almost nothing about the struggle to gain women the vote in Great Britain. I'm a little more familiar with the Canadian struggle, which to my knowledge, was neither so protracted, nor so bloody. In Sally Heathcote, Suffragette, Mary M. Talbot uses a fictional character to explain and explore the various and fractious groups that fought for decades to get the vote, and the beginnings of some respect as equals, for women. We meet the upper class women who threw themselves into the movement, as well as some of the lower class women, like Sally, who joined them and sacrificed much to gain enfranchisement. Beyond demonstrating and publishing newsletters, the women used violence to further their cause. I was surprised to see campaigns of window smashing and even the firebombing of the Prime Minister's unoccupied home. As well, I was surprised to learn about how these women entered into a revolving system of imprisonment, hunger strikes, torturous force feedings, and eventual release, only to start all over again at the next possible demonstration. Talbot's Sally has a strong narrative voice, and reports as much on the internecine rifts within the movement as on the advancement towards their goals. Of course, it is the coming of war that led to increased opportunities for women, as men were either away or killed in such numbers that women needed to take on many of their social roles. The art team of Kate Charlesworth and Bryan Talbot works great. The washes of colour on high quality paper make this book really stand out, and the artists (I'm not that clear on who did what) imbue each character with a great deal of personality. No one radiates displeasure like Mrs. Pankhurst. This was a great book shining a light on a topic rarely seen in comics.